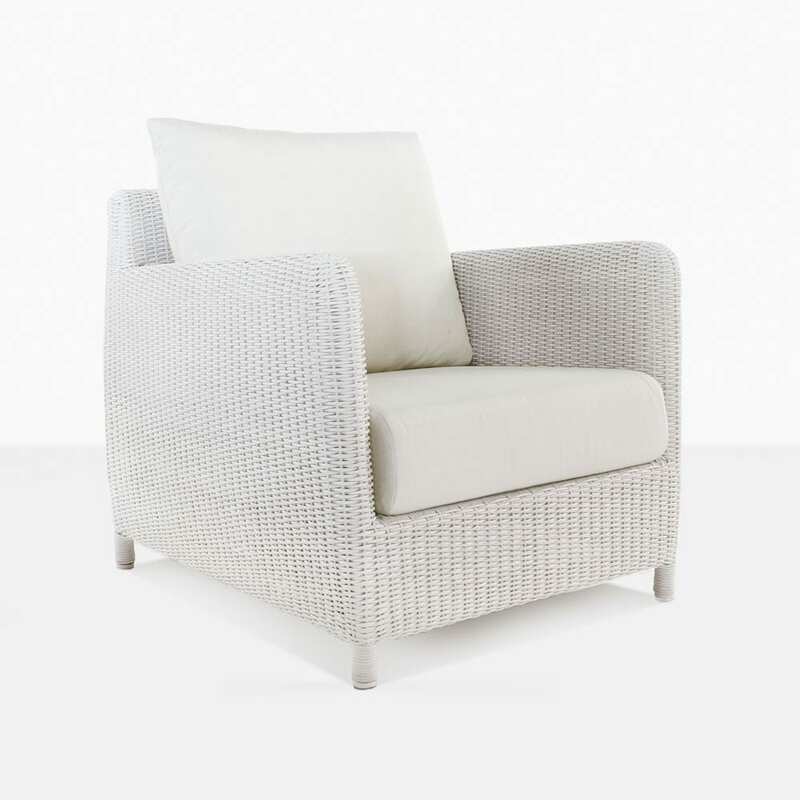 Nestle into a comfortable indulgence with the chic presence of the Valhalla Outdoor Wicker Collection in striking White. A gorgeous collection that honours the traditions of the past while using incredible, contemporary outdoor materials, Valhalla features two stunning pieces in a modest but impactful collection. The Valhalla Wicker Club Chair and Outdoor Sofa are pieces that create a sense of warmth and comfort in any space. Each Valhalla item showcases curved lines and deep, wide seating finished off with thick, cushy Sunbrella® cushions. 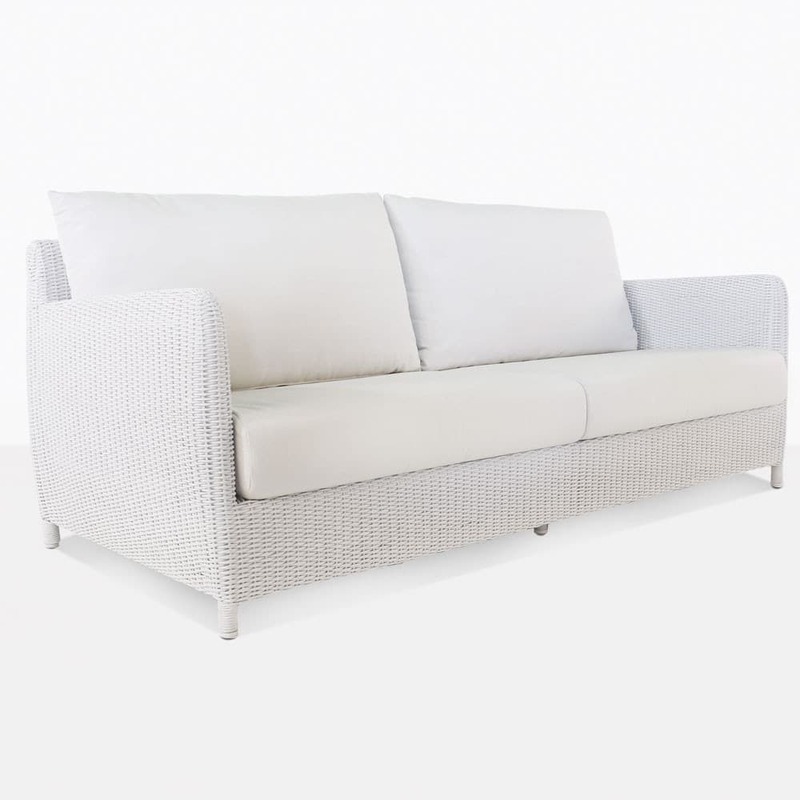 Because of the seemingly delicate wicker, Valhalla has an airy, fresh appearance that is ultimately chic and stylish. If you have a beautifully tiled courtyard, then we can think of nothing better than a Valhalla Outdoor Wicker Sofa with two of the gorgeous Valhalla Club Chairs! Place a coffee table of your choosing in the middle of your setting and enjoy the wonderful, welcoming and sophisticated suite you have created. All you need is amazing company! These pieces also work beautifully on their own. Try a Valhalla Club Chair in a quiet, sunny corner of your garden, with a lovely side table, and you’ll be delighted with the hours spent outdoors in extraordinary luxury. You may be delighted with Valhalla, but we know you’ll be even more thrilled to know that it is completely suitable for outdoor use! A strong aluminium frame which has been powder coated is wrapped brilliantly with through dyed synthetic wicker. This UV treated product looks incredible on furniture and lasts and lasts outdoors! We are proud to announce the cushions on the Valhalla Sofa and Club Chair feature Sunbrella® fabric on QuickDry® foam, meaning ultimately, that you’ll enjoy your furniture for years to come! Be impressed with Valhalla Outdoor Collection in White in your space! Call Design Warehouse now to order yours today!